This month Pasta Please is being hosted by Shaheen at Allotment to Kitchen and the theme is chilli! Pasta Please is a blog event whose home is with Jacqueline at Tinned Tomatoes, but it is often out and about with guest hosts which gives it a new lease of life. The Chilli theme gave me another opportunity to use my Galloway Chilli Original jam. 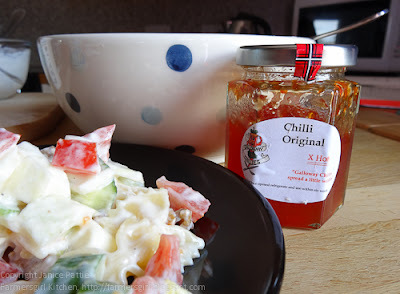 This is a very hot chilli jam so you only need a very little to boost up your dishes. 225g good quality pasta, cooked in boiling salted water, drained and cooled in cold water, then drained again. 1. 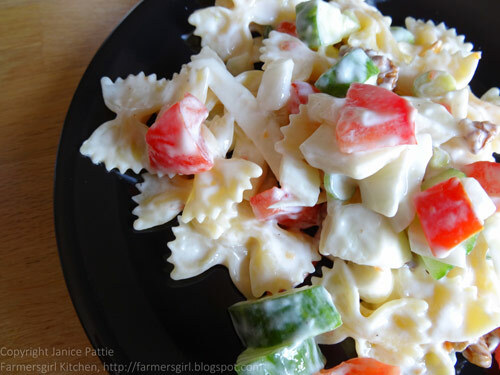 Mix the salad ingredients together in a bowl. 2. Mix the dressing ingredients together and season to taste. 3. Mix the dressing into the pasta and vegetables, cover the bowl and leave for flavours to mingle for about 20 minutes. I served the salad on lettuce leaves but you can just eat it as it is or serve it with other salads. That looks lovely and I am sure I will be joining in this month, if the theme is CHILLI! Oh wow, this looks yummy and really interesting. Never used chilly jam/jelly with a pasta. I have some orange chilly marmalade and planning to use it in this recipe. You have a lovely blog Karen.